I flew from Rome to Casablanca where I met three friends from Toronto at the airport. One of them, Lindan, used to conduct food tours in Morocco in the past and knows the country well so she organized the whole trip, a lot of it based around buying, cooking and tasting food. We are staying in riad hotels. A riad is a house (dar) with a garden, in the medina (walled city). In the Islamic tradition, dars are completely unprepossesing and lacking ornamentation including windows on the outside but highly ornate on the inside with rooms arranged around a central courtyard. We took a shuttle to Marrakech where we stayed opposite the Royal Palace at a riad called Dar les Cigognes (House of Storks) which is actually two houses joined together. The main house originally belonged to a Jewish family and has windows facing the street while the other originally belonged to a Moslem family, and only has windows facing the inner courtyard. 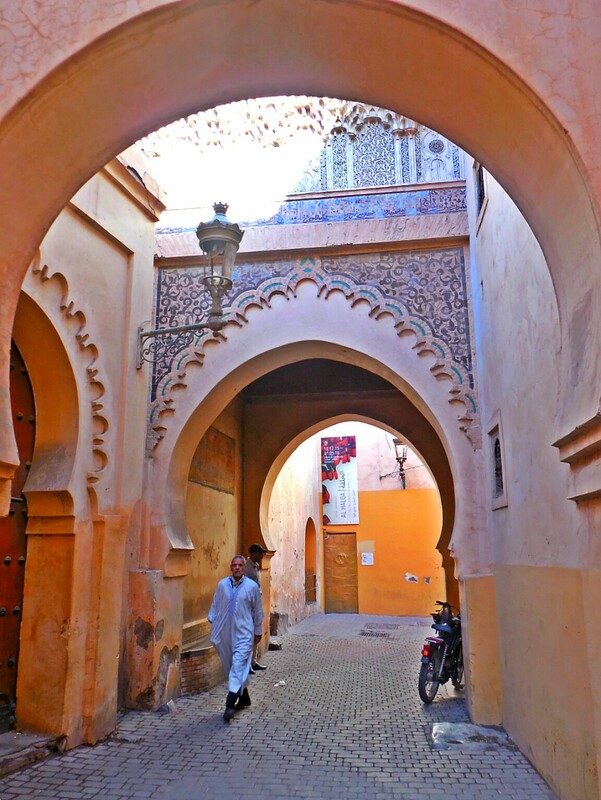 This is a typical distinguishing feature of the houses in the medina which once had a large Jewish population. The name of the hotel became clear when we went up to the beautiful terrace where we could see a huge stork’s nest on top of one of the Palace towers. 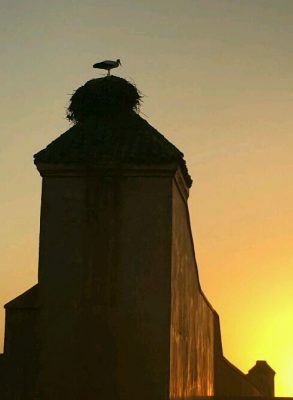 One evening we saw a stork sitting on the nest which kept us entertained for quite a while. 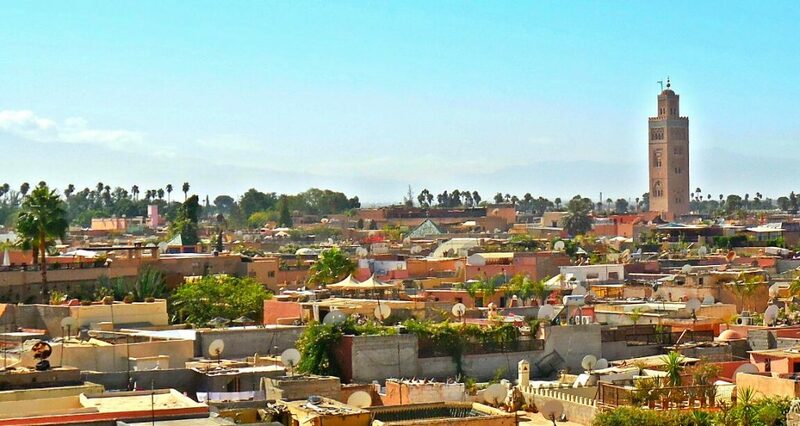 Not that we needed any extra entertainment in Marrakech which is a fascinating city in a desert-like landscape on the edge of the High Atlas mountains. The day after we arrived, we had a quick tour of the medina to get our bearings. The large central square, Jama-el-Fna, is surrounded by a maze of narrow streets not accessible to traffic where goods are carried by donkey carts. The windowless walls of the houses create the feeling of enclosed and mysterious streets. 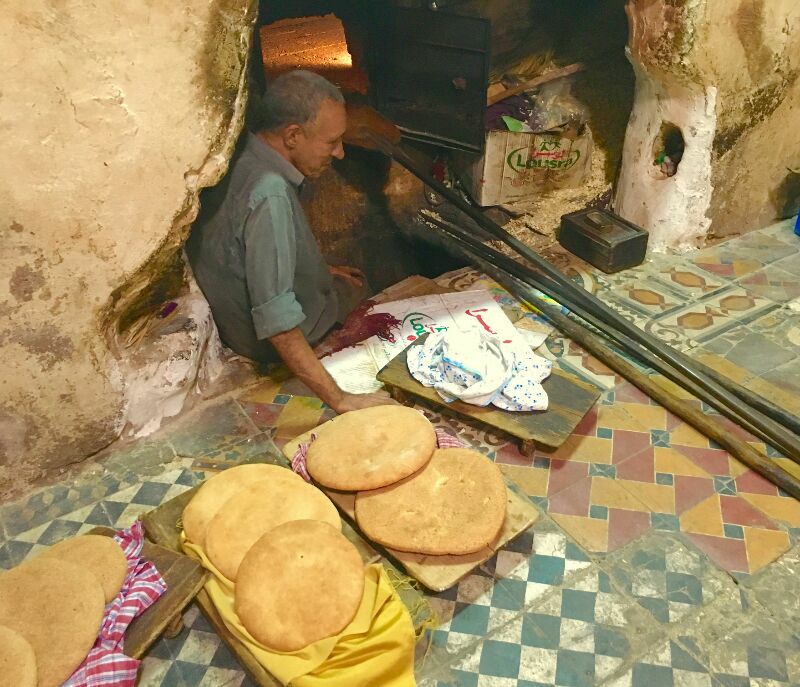 Each neighbourhood in the medina has five essential places, a bakery where women bring in their bread to be baked since old houses didn’t have ovens, a fountain for water, a hamam (bath house), a nursery school, and a mosque. 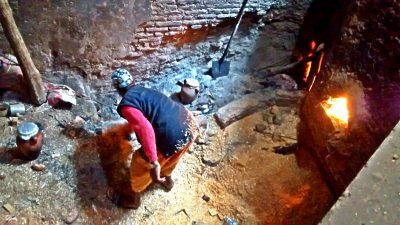 The bakeries are still stoked by wood and function as they did hundreds of years ago. As many as 2,000 loaves may be baked in a day. Every platter of bread is identified by the cloth it is covered with so that it can be returned to the right person after the bread is baked. Next to the hamam, down a few steps, is a wood fire for heating the bath water. The ashes close to the fire are used to cook a dish called tangia, the only dish traditionally cooked by a man. A man goes to the market with an earthenware pot and first buys meat which is placed in the bottom. This is followed by vegetables, water, spices and oil. The pot is sealed, shaken and left in the hot ashes for several hours to cook slowly so that the one-pot meal is ready for collection on the way home. Our own introduction to Moroccan cooking started with a trip to the food section of the souk (market) followed by a cooking class. The souks are truly a feast for the senses with their arrays of colourful textiles, pottery, jewellery, spices, dried fruit and nuts, perfumes and oils. In the food section, there is everything you need for daily cooking including live chickens so you can pick the bird you want. 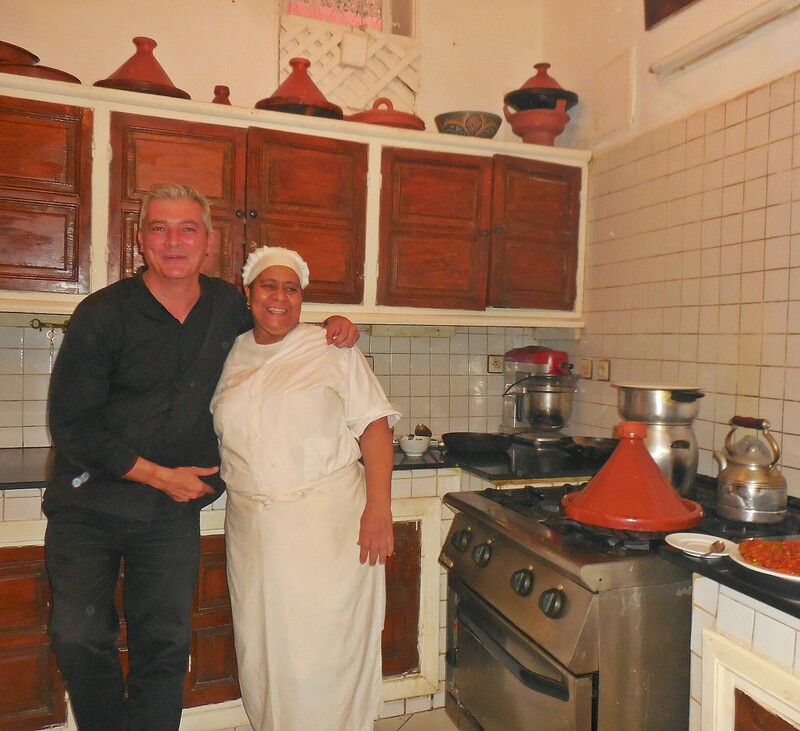 Our cooking class took place in the kitchen of our riadh where the cook, Foozia, is a ‘dada’ which means that she was trained to be a cook by her mother who was trained by her mother and so on, going back generations. Foozia only speaks Moroccan and the manager of the riad, Pierre Erve was there to translate. It wasn’t long before Pierre, who is French, opened a bottle of wine to enhance our cooking experience. Moroccan meals often begin with a selection of salads made with cooked vegetables. We learned to make a couple of salads including zalouk made with diced sauteed aubergine. Then a vegetable couscous where a selection of five vegetables is put in the bottom of a pot together with spices, oil and water all brought to a rolling boil with the couscous placed in a steamer above to cook. Our meat course was a chicken tagine cooked in the traditional earthenware dish of the same name richly flavoured with ras-el-hanout, a blend of 30 to 50 spices. After all the food was cooked, we sat down to dinner and enjoyed the fruits of our labour. Apart from cooking and eating the food we cook, Lindan knows all the best restaurants. We had the most delicious lamb shoulder with caramellized onions and almonds in a restaurant called Al Fassia which had to be ordered a day in advance. This restaurant is owned and staffed entirely by women. Unusual in any country never mind in a Moslem one. The King of Morocco is progressive and liberal and has introduced several laws favouring equality for women. Anyhow, to go back to food, at the rate I’m eating, I don’t think the clothes I arrived with will fit me on the way home. I might have to buy a kaftan which is a beautiful but shapeless garment designed such that a woman’s shape is not revealed to the public, and which easily accomodates a few extra pounds. now i’m hungry and want to go immediately to this seemingly exotic and charming city! Hi Niamh pointed me to your wonderful blog. My husband and I leave for Morocco in December and I wanted to ask about the restaurant you mentioned in Marakesh. Al Fassia. was it Al Fassia Gueliz (in the centre of Marakesh or “Al Fassia Ageudal” there seems to be two mentioned on their website. It was the Al Fassia Gueliz, 55 Boulevard Mohamed Zerktouni. If you want the lamb shoulder which was excellent, you have to give them 24h notice. We also had a nice meal in Marakeshi next to the Cafe de France on Jemaa-el-Fna square. It’s very touristy (complete with musicians and a belly dancer!) but I had an excellent fish tagine there. Our sole male companion had been given instructions by the person who recommended it, that he was expected to put money down the belly dancer’s bra but he got cold feet and insisted on leaving before she arrived.